I was in class Xth when I first heard about you. My friend told me that these matches would be telecasted in some new channel ESPN, which I cable provider didn't provide. I wasn't too keen anyways. Next day he told me that you hit a century on Lords. Bahut hi beautiful khel raha tha yaar, aur off side main to amazing hi maar raha tha. Then came Toronto, the Sahara Cup. You won the man of the match with your batting. Sachin, who was captain then, said - We have a secret weapon, and he did it for us. Next match, small target for Pakistan. They were doing well. Suddenly you came and took 5 wkts. We won and you won the man of the match again. Sachin - As I said we have a secret weapon, and he can bowl too. Another match, another man of the match. and then another one. Sachin was running out of words. All he said was - Well, our secret weapon is not longer secret. And you became the God of offside. Then I went to college. you and Sachin became the most successful opening pair for India. And you would come at no 6 in tests, inevitably hitting a century playing with tailenders. And inevitably you would come down the track and hit the ball for a six on mid on. Sixes from Indian Batsmen were a rarity those days. We actually believed that Rahul Dravid cannot hit a ball for six as he doesn't have enough power. This and the Straight Drive six from Sachin were the treats that we would watch a match for. And what happened in that faithful match with Sri Lanka Sourav. You just kept on coming down the track on Murali and hitting him for a six. A score of 183 to break the age old Indian record by Kapil Dev. I haven't seen anything like that before. And I thought, what are you doing Sachin, this record should belong to you. And he heard me too. In the hindsight, Sachin and Sourav with #1 and #2 best individual scores for India make perfect sense. Me and my friend used to just read statistics on cricinfo as a pastime. We found out, not surprising though, and that you have taken less matches to cross each 1000 runs landmark. I remember this link, At that time there used to be only 2 names there, and your name on the top (and only one name in the next list). An injury to Ajay Jadeja and you were given captaincy for one ODI which we won. Then among some match fixing controversies and a ban on Jadeja, you became the captain. That was the time when we realized that your true greatness was more than batting. You became the most aggressive Indian Captain ever. Statements by the Steve Waughs would now get matching answers. You became the center of Indian Cricket, as many critics and there were fans. Some would say you couldn't play on the leg side. Others would say you can't play bouncers. But we the college youngsters just loved your attitude. You made us believe that we can be more than just tigers at home. And forget cricket, you taught us aggression, and the confidence to take on the world. It was you under which we witness the most historic wins. That Very Very Special Eden Gardens Test, that Natwest Final where you took of the ur shirt. In there anyway one can forget them. Then there was the overseas victory in England. And it didn't come easy. You took the brave decision to bat first on a testing pitch, then Dravid passed that test with flying colors to hit a century on day 1. Then Sachin and you took over and just murdered the English bowlers. I remember the umpire offered you guys light and you didn't take it. Instead, both of you scored 83 runs in the next 10 overs that we bowled. The first time when the God, the Wall and the Prince all hit centuries in the same test, and that too an overseas one. We had to win that one. Then people started questioning your batting. We thought its just a lean patch and will be fine as long as you are leading well. Then came the World Cup. Suddenly the pacers who used to be the weakness of the team became match winners. Suddenly the fielding improved. Suddenly there were weird things happening like Team Huddles. Before the Pakistan match, you said We just need to win every match. And you did. Except Australia. But you did establish India as the second best team after all. But what happened then Sourav. That lean patch would simply not end. Its not that we didn't wait. 3 years is a long long time. Its a long time when everytime you would watch a match hoping to see that flair again that Sourav was known for, and all you would get a yet another disappointment along with everyone else saying bad words for you. You got a century in Australia and you almost made it a miserable last series for Steve Waugh. But we wanted more than that. You only taught us aggression. And aggression also means dropping a senior player mercilessly if its good for cricket. But you seeemed to forget your own principles. And one day you were out. I thought it was probably good for you. But I felt bad the way media used it. But that was is their business, isn't it. It indeed was good for you as you fought back. You taught us yet again on what to do in unfavorable circumstances. You fought and fought hard. You won back ur place. And you proved yet again that you deserve a much better exit than what you got earlier. Cricket ceased to be the same and so did life 6 years after college. There would not switching off the TV when Sachin would get out. There would not be a sense of confidence that one need not worry as long Dravid in on the crease. And there would not be leader like Sourav who would just not take sh*t from anybody. You can never forget heroes that you grow up with. And You are one of those. 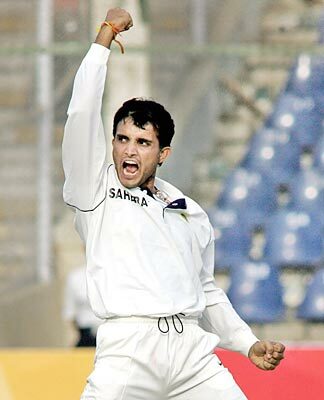 Farewell Sourav, I salute you, as much for being in the game as for leaving it.